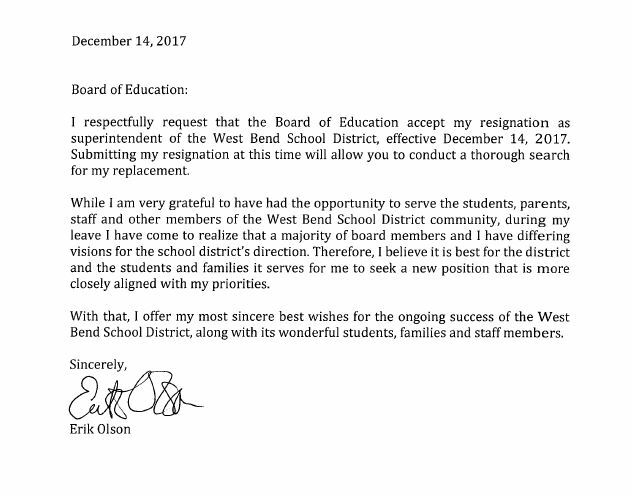 As expected, the West Bend School Board met this evening to accept the resignation of Superintendent Erik Olson before the end of his contract. Here is his resignation letter. His comment about the new school board having a different vision is spot on. The board that hired him was decidedly more rational and results-oriented than the current board. The new majority on the current board has proven to be leftist, opaque, and unprofessional. It was clear from the beginning that they did not like Superintendent Olson and were working to force him out. They succeeded and can now fill the position with someone more in line with their leftist agenda. This comes at a time when the district is implementing a new compensation plan for teachers and will be asking the voters for a more money via referendum. I wish Superintendent Olson and his family the best. He moved his family to West Bend and invested in the community for a job where I’m sure he planned to make a positive impact. Unfortunately, he has become another victim of this dysfunctional district. On another note, there is an election in April for two board seats. One of them is open. The other is currently held by one of the two remaining conservatives on the board, Monte Schmiege, who has not declared whether he will seek reelection. The district needs some sensible conservatives to run for the open seat and for Schmiege to run for reelection.